...it's always tea-time...: "CLEAR THE COAST!" LEAR the coast! clear the coast!" cried Albert and Frank, as they came down hill swiftly on Frank's new sled. "Look out for that woman!" cried little Harry, who was standing at the top of the hill. A poor German woman was crossing the road. She had a large basket full of bundles, which she carried on her head. In her right hand she had an umbrella and a tin pail, and on her arm another basket. Truly, seeing that the roads were slippery, she had more than her share of burdens. She tried to get out of the way; but Frank's new sled was such a swift runner, that it came near striking her, and caused her to nearly lose her balance, putting her at the same time into a great fright. "You bad boys, you almost threw me down!" she exclaimed, when she recovered from the start they had given her, and looked around to see if she had dropped any of her bundles. But down the hill they rushed on their sled, Frank losing his hat in their descent, but little caring for that in his delight. The two boys, after reaching the foot of the hill, turned, and began to drag their sled up again. "That woman," said Frank, "called us bad boys. Let us tell her that we are not bad boys. We did not mean to run her down." "Here comes Harry, running. What has he got to say?" asked Albert. "I tell you what, boys," said Harry, "you'll be taken up if you run people down in that way." "Why didn't she clear the coast when I told her to?" said Albert. "Why didn't you steer your sled out of the way?" returned Harry. "I didn't hit her, did I?" said Albert. "No; but you were trying to see how near you could come without hitting her," replied Harry. "It's too bad to treat a poor old woman so!" "So it was," said Frank. "What shall we do about it?" "That's for Albert to say," exclaimed Harry. "Well," replied Albert, "the right thing will be to offer to drag her bundles for her on the sled." "That's it!" said the other two boys. By this time they had reached the place where the poor woman was moving slowly along under her heavy burdens. She seemed very tired, and sighed often as she picked her way timidly over the frozen snow. "We are sorry we frightened you," said Albert. "We did not mean to do any harm. Put your baskets on this sled, and we will drag them for you as far as you want to go." "Well, you are little gentlemen, after all," said the woman, "and I'm sorry I was so vexed with you." "You had cause," said Frank: "we were to blame." 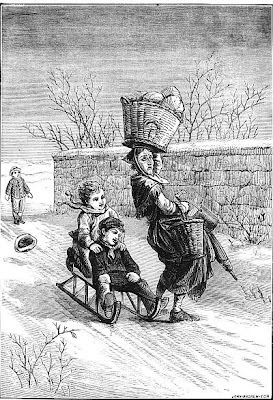 Then she put her two baskets and the tin pail on the sled; and the three boys escorted her to her home, where she thanked them heartily for the way in which they had made amends for Albert's bad steering.